With the recent string of outdoor games seemingly becoming the new trend in hockey, Michigan and Michigan State will reportedly play at Michigan Stadium in December. The Detroit News reported yesterday that the Wolverines will host the Spartans on Dec. 11 at 3:00 p.m. 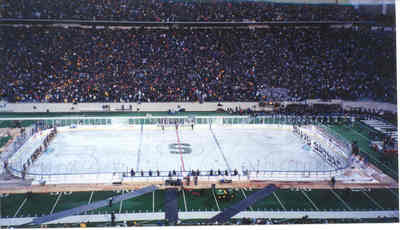 The first time Michigan faced Michigan State outdoors, the teams played to a 3-3 tie at Spartan Stadium on Oct. 6, 2001 in the "Cold War" game (pictured) that drew a record college hockey crowd of 74,554. While no official announcement has been made as of Thursday morning, one could come as early as this weekend when the two teams play Friday night in East Lansing and Saturday night at Joe Louis Arena. UPDATE: Michigan made the formal announcement today. The game will be called The Big Chill at The Big House.